A 15-year-old girl in hospice care was determined to attend a Florence and The Machine concert in spite of her illness. But as the day drew nearer, it became evident that she was too sick to leave the Austin, Texas medical facility. So, on Friday, May 20, Florence came to her instead. 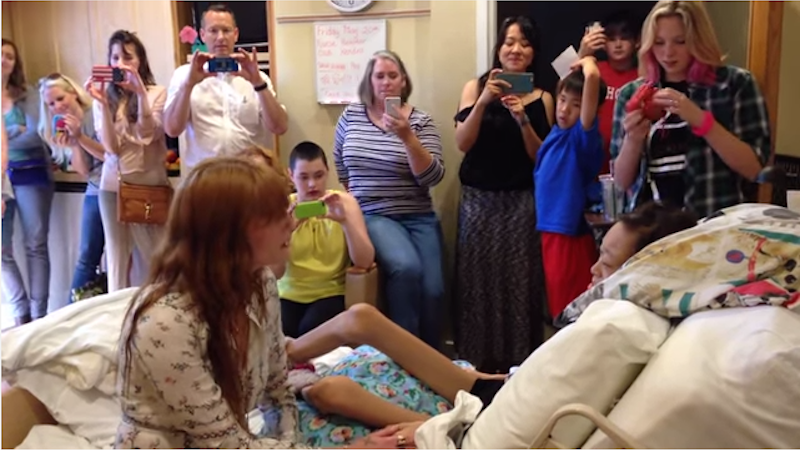 People reports that Florence Welch performed for the young fan in her room at Hospice Austin’s Christopher House as a crowd of friends looked on. Hospice staff contacted the singer after their patient learned that she would have to miss Florence’s concert. Nurse practitioner Christie Kramer tells People that the intimate concert brought forth “so much joyous music and singing and tears” — a beautiful and meaningful event made necessary by terrible circumstances. After determining that her patient was too ill to leave, Kramer was involved in the effort to bring Welch to Christopher House. You can watch the full “Shake It Out” performance in the video below — but grab some tissues before you do. Images via YouTube and Instagram. Video via YouTube.